It was all I could do not to vomit when I stepped from the Beetle. 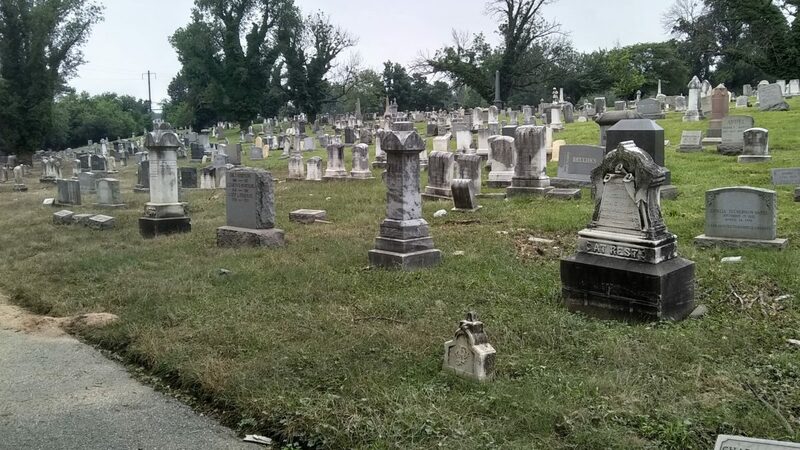 I’ve been to Baltimore’s Loudon Park cemetery a few times in the last year, first to locate my great-great-grandmother’s grave, which I found right away, and then follow-up visits to find my great-grandfather’s brother’s grave, which I finally located about six weeks ago. The reason for this visit was different. There was nothing I wanted to find. 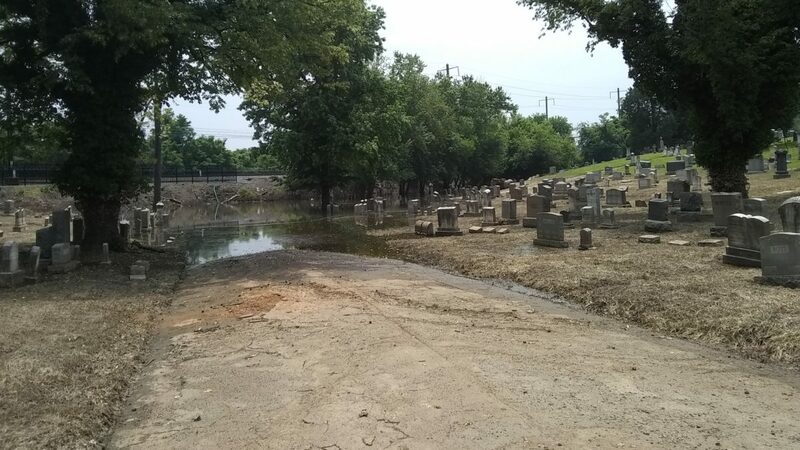 Loudon Park Cemetery had flooded due to the recent rains. 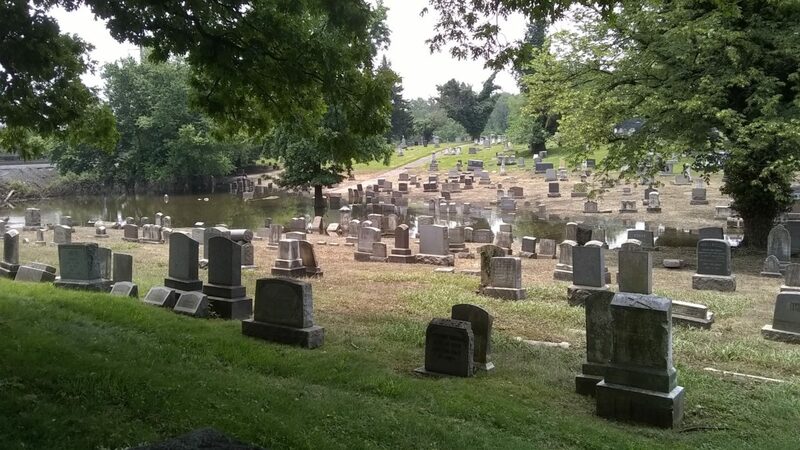 When I looked at the photo gallery on the Baltimore Sun website, I recognized the area that was underwater — it was where my great-great-grandmother Susan was buried. I could make the pillar out in some of the photographs, and a video on the website panned across it. Susan died seventy years before I was born, even my mother only knew people who had known her. I didn’t know her name until twelve years ago, I didn’t even know how she died until last summer, yet the Sun‘s photos distressed me and I decided, when I really should have been writing a press release, that I would drive down to Baltimore Saturday morning to see for myself the situation at Loudon Park, even do some clean-up of the site, if need be. I stopped at the Giant on Wilkens Avenue near the cemetery, picked up disposable rubber gloves as well as a bundle of carnations and a miniature American flag to leave at the grave. Heavy duty trashbags I had, gloves I did not, and the miniature American flag I’d been given by a Webelos Scout at Dallastown’s Memorial Day parade I’d unintentionally left on my dining room table. I turned into the cemetery, went to the right, turned toward the old section of the cemetery, passed through the gate, crossed the creek. I climbed the small hill, saw the caution tape closing off the road ahead, turned to the left as I normally would have anyway and then down. I thought I was ready. Nothing could have really prepared me for the smell. I’ve smelled nothing like it. It was more than the smell of stagnant water. It was the smell of death, of old bodies underground, their odors freed by the saturation of the ground by the rainwater. It was overpowering, it was everywhere. My stomach lurched, and I gagged. The access road I typically use — and park along — was unpassable. 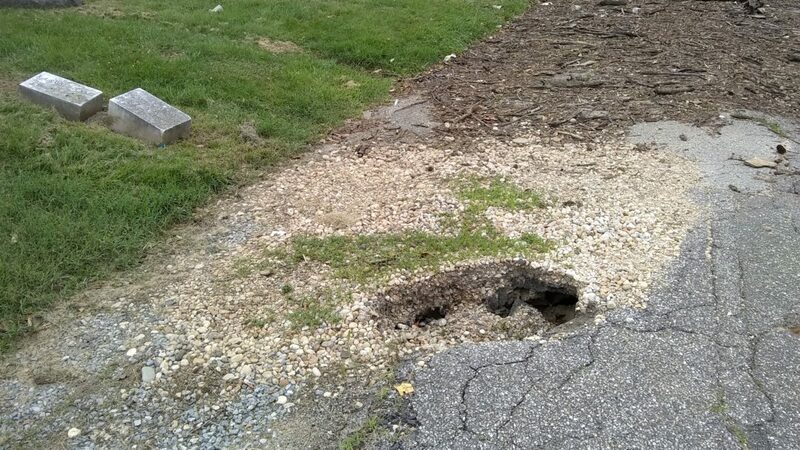 Not that I could have gone down it — it was roped off — but a sinkhole had opened and collapsed the asphalt, then there was six or seven feet of tree limbs and garbage strewn in an enormous mass across the roadway, and, of course, it terminated in the water. 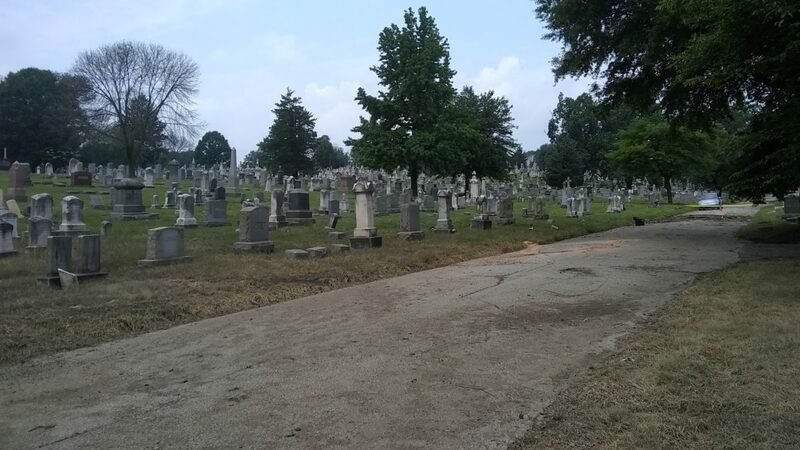 Loudon Park is a hilly cemetery, and that area where sections U, RR, and Whatcoat meet happens to be at the bottom of two hills, and it’s dammed off by the Amtrak tracks. The water runs downhill, there’s nowhere for it to go, and it pools. The water on Saturday was down from the pictures posted on the Baltimore Sun website, but there was still an enormous lake. There were signs of how extensive the lake had been — tree branches and garbage that floated out and came to a rest when the water receded, the layer of mud and silt that lay across everything, even the way the grass was mowed around the edge of the water. One of the strangest sights was an enormous tree trunk that was well up on the Whatcoat hillside, having floated there and come to a rest. 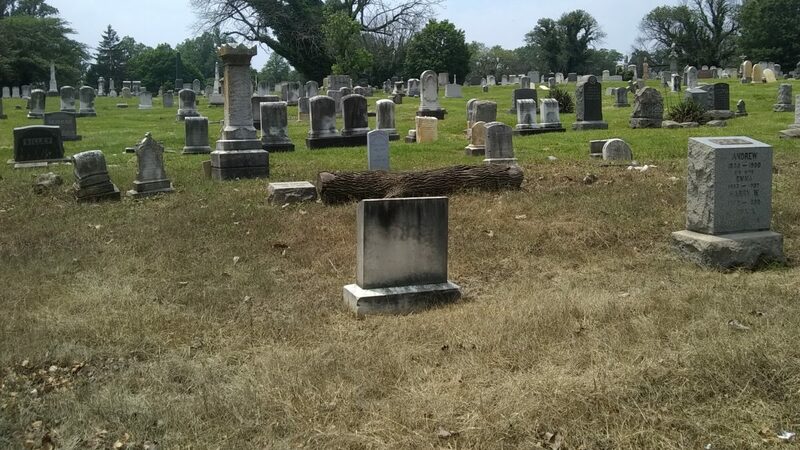 The Boswell monument, where my great-great-grandmother is buried, seemed unharmed. The flower holders were empty of garbage, and the old rusted cans I discovered were there last year remained untouched. 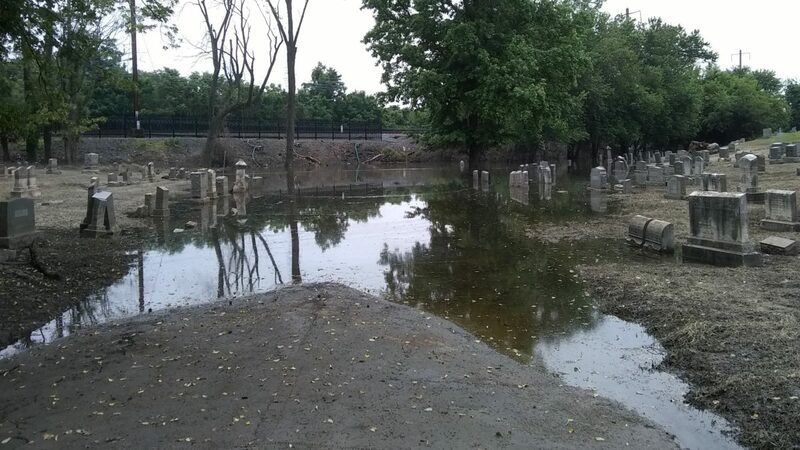 Susan, her daughter Isabelle, and the rest buried with them had been, by my reckoning, under about a foot and a half, maybe two feet of water, before the water receded. I took photos. Looking at them later, I was struck by how little of the garbage appeared. In the moment, standing there, all sorts of human garbage — Doritos bags, plastic cups and straws, beer bottles and soft drink bottles, DVD cases, a condom still in its wrapper, even the lid to a Rubbermaid tote — were all around. In my photos, I see almost none of it. Perhaps I unconsciously shot around the garbage. Perhaps the tufts of grass and the layer of mud conspired to hide it from view. Then I set to work, putting on my gloves and taking up the garbage bag. I began at the Boswell monument and I worked in concentric circles, picking up everything man-made, eventually going out to about twenty-five feet in every direction, only stopping once I reached what had clearly been the edge of the water, where the grass was somewhat freshly mown. Branches and leaves I left alone; the groundskeepers could deal with those. Same with the raccoon carcass. Once I finished, I carted the bag about halfway to where I had parked the Beetle, beyond the sinkhole. (By pure chance, I dropped the bag near a group of Boswell headstones. I need to check later to see if they’re connected to Isabelle’s first husband.) I then divided the carnations and placed them in the flower holders on either side of the monument, and I planted the American flag I’d bought for Phil Stallings, the second husband of Susan’s granddaughter and a World War I veteran. 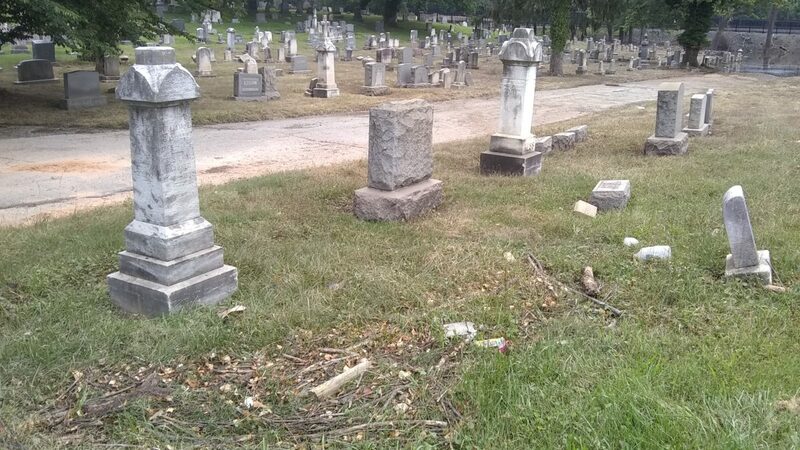 That little corner of the cemetery, at least, looked like it was supposed to. 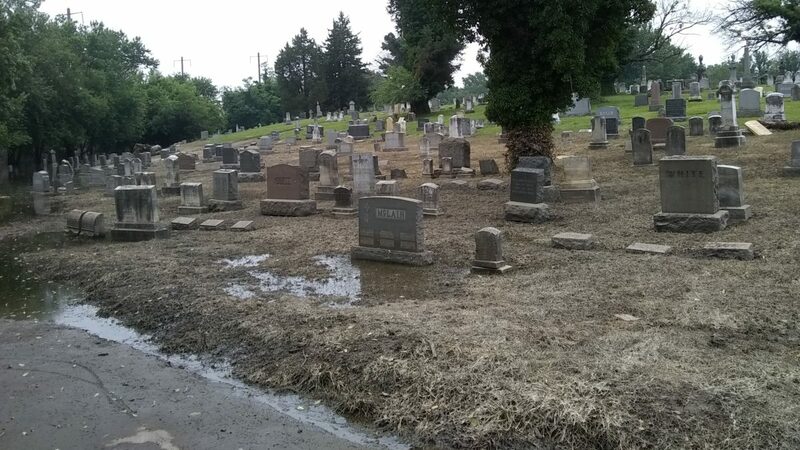 It once again looked “normal,” the way a cemetery should look. I walked around the blighted area and took more photos. 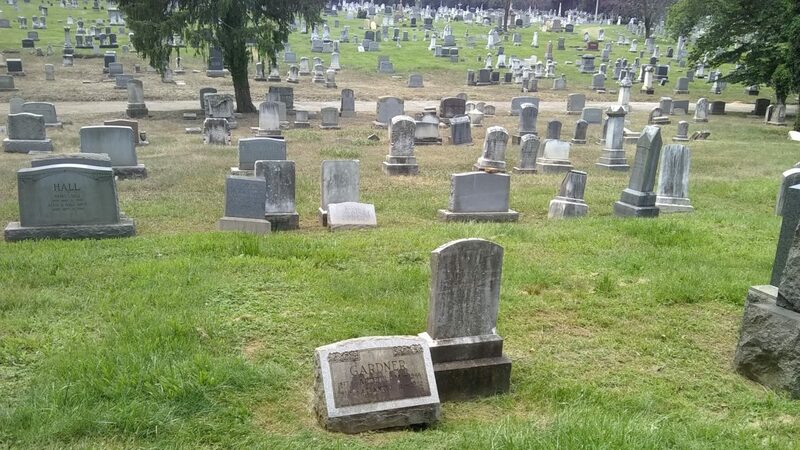 I climbed the hillside of RR, where Arthur Gardner is buried, because that gave me a good vantage point to see what had happened. From above, the water had an obsidian quality. 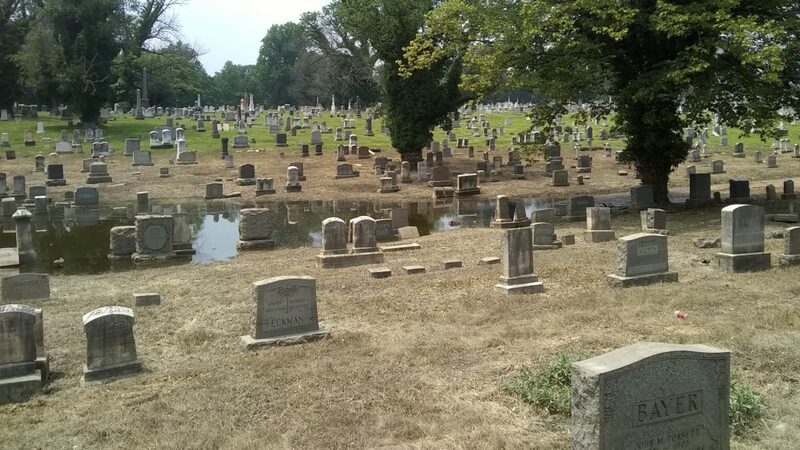 The tops of headstones still underwater reflected in the surface, and geese congregated in the water as though it were perfectly normal for a lake to be right there. 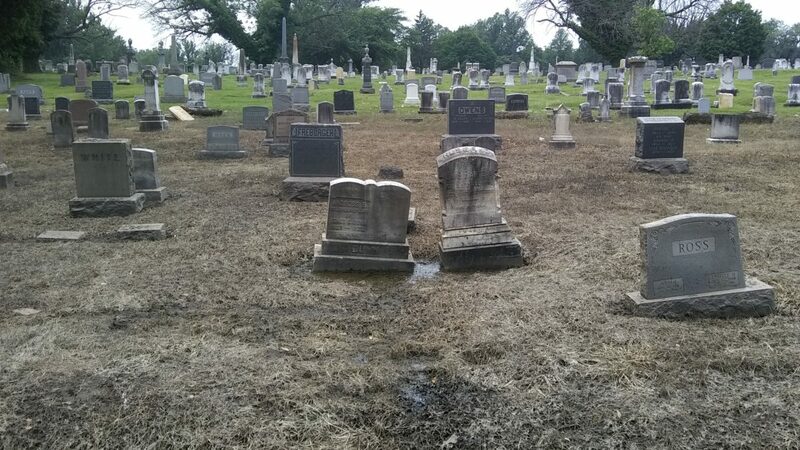 If it weren’t so distressing to see graves wrecked, underwater, encrusted with mud, the whole scene would have been serene. I stopped at the other family sites in Loudon Park before I left. They were fine. 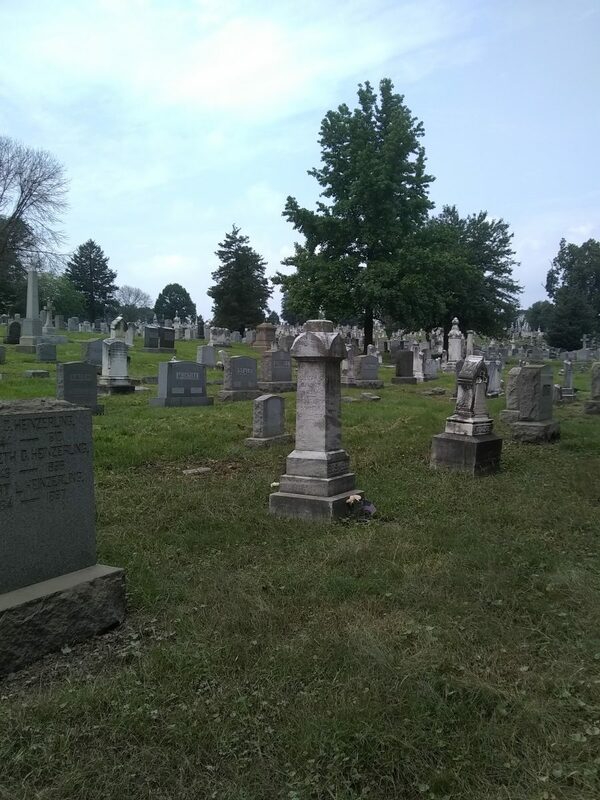 My great-grandparents are buried at one of the highest points in the cemetery. I left the bag of garbage I’d collected in one of the trash cans at Giant. It smelled, and I didn’t want to leave it in my car. A worker from Giant, on his smoke break, watched me do it and thankfully said nothing. As it was, the smell of Loudon Park stayed with me for hours, and I swear that the t-shirt I wore was infused with that odor. Later, I had the thought that my grandfather would have done the same thing that I had done. I could even imagine how it would have gone. He would have read the newspaper when he got home from work and seen the article. He would have been distressed, and he would have called his brother Gilbert first — “I don’t know if you saw this in the Evening Sun, but there was flooding at Loudon Park after all those rains, and I’m going to drive over tomorrow morning to make sure everything’s okay” — and then called his other brother Myrvin just to let him know. He’d have stopped at the site of his parents, brother, and sisters, and then he’d have gone to look at the flooding to see if there was anything he could do. Then on Sunday, Gilbert and his wife Emily would have driven over to my grandparents’ house; the boys would have talked on the porch, while Emily and my grandmother would have had tea in the kitchen. That’s how it would have gone. But that’s not why I went. Yes, my grandfather would have done that in the same situation, but It didn’t even occur to me until well after I’d stuffed Giant’s garbage can full of junk. I went because I was distressed, because I needed to see for myself, and I needed to see if there was anything I could do. I still feel a certain distress, even sorrow, at the situation there, but I went and I did, and I’m content with that. The sight at Loudon Park Cemetery when I arrived. The sinkhole. There’s a Reese’s Peanut Butter Cup wrapper in there. I was not able to extract it. The Boswell monument and burial site. Section RR of Loudon Park (on the opposite side of the access road) as seen from behind my great-great-grandmother’s grave. You can see the mud on the hill. 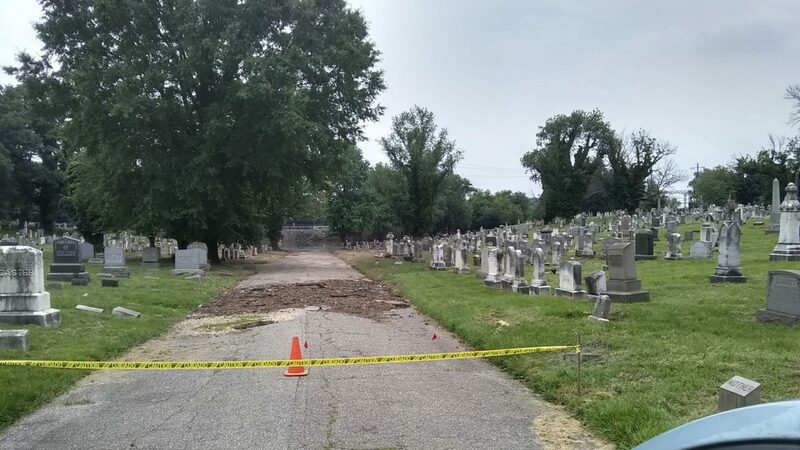 A second sinkhole is opening up on the access road, pretty much adjacent to my great-great-grandmother’s grave. The Whatcoat hill. There’s a clear demarcation between what had been underwater (all brown) and what had not been (all green). Upper right, near the line between the mown grass and the mud-encrusted grass is the log I mentioned above. I didn’t even notice, at the time I took the photo, that it was there. It was only when walking among the graves later that I stumbled across it in startled surprise. Headstones in Whatcoat still partly underwater. I went to Arthur Gardner’s grave on the RR hillside. From this vantage point, it’s very clear what had been underwater and how extensive the flooding had been. This would be serene were it not so sad and unfortunate. The ground was still quite soggy here. The log on the Whatcoat hillside. Another look at the “lake” with its obsidian surface.